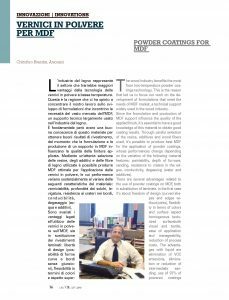 Verniciatura Industriale magazine interviewed Cristoforo Brendas from Arsonsisi about powder coatings technology for MDF (Medium Density Fiberboard). 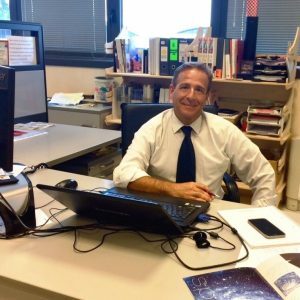 Cristoforo Brendas, Arsonsisi Powder Coatings Business Manager for Italy. The wood industry benefits the most from low-temperature powder coatings technology. This is the reason that led Arsonsisi to focus its work on the development of formulations that meet the needs of MDF market, a technical support widely used in the wood industry. MDF performances change depending on the variation of the following material features: paintability, depth of furrows, sanding, resistance to craters in the edges, conductivity, degassing (water and additives). Through careful selection of the resins, additives and wood fibers used, it’s possible to produce best MDF for the application of powder coatings. 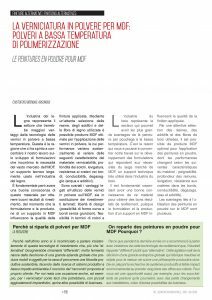 There are several advantages related to the use of powder coatings on MDF, both in substitution of laminate. In the first case it’s about freedom of design (curved shapes and edges without joints), flexibility in terms of colors and surface aspect, homogenous texturized surface both visual and tactile, ease of application and manageability, reduction of process costs. The advantages with liquid are elimination of VOC emissions, elimination or reduction of intermediate sanding, use of 97% of powered coatings used, easy recycling and absence of waste treatment, full application on the edges in a single phase. 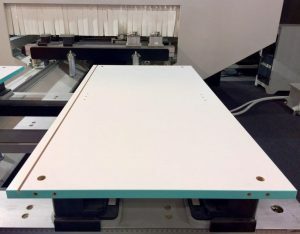 The traditional way of powder coatings application is based on electrostatic techniques and requires conductive substrates to work. Since MDF is a non-conductive material, there are methods to make it so, such as the introduction of conductive agents in its formulation or the application of a conductive liquid primer before proceeding with powder coating the support. Once dried it is possible to apply powder coating. The most effective method is the pre-meating by IR lamps on both panel’s sides, whose temperature must be about 90°C once out from infrared oven. The coating of the substrate must take place within 1 or 2 minutes from the preheating process using a tribo or crown spray gun. The best results are obtained using a combination of infrared and convective heat. On the other hand, it is possible to use infrared heating only. It is essential to use a MDF of adequate quality: some supports are so conductive that the powder coatings can be applied without preheating. However, since the quality of MDF may vary from batch to batch, it’s advisable to preheat to obtain an homogenous film thickness on the whole item. Light preheating with IR allows additives migration from the MDF substrate to the surface, making the panel more conductive and easy to coat. The Selac® XFC – Extra Fast Curing Powder Coatings and Selac® UV powder coatings range is the result of a fifteen-year work of Arsonsisi R&D laboratories: powder coatings thermosetting for thermal crosslinking (XFC) o UV. Selac® XFC powder coatings are particularly suitable for low quality requirements such as those of shelves, TV/PC stands, desks and standard furniture for general use, considering the lower costs/m2 compared to UV products. They need a single melting and polymerization step and between 10 and 15 minutes of processing time. While Selac® UV products are used for high quality requirements such as office furniture, kitchens and more because of the high mechanical and chemical properties which characterized them. These lasts are subjected to a drastically reduced thermal stress considering XFC products and they require process times of about 5 minutes. Currently there are few powder coatings UV e XFC lines for MDF, but an evolution in this sector is expected and Arsonsisi is leading a market analysis to define needs and find new solutions. Read the full article of Verniciatura Industriale available also in English on VDL magazine.